The molecules are separated according to their size and their electric charge. The molecules can then be compared to other molecules based on their size and charge, which is especially useful if the size and charge of specific molecules is known. This allows identification of molecules based on their size and charge. It is called gel electrophoresis because it occurs in an agarose gel, which is a substance that is extracted from seaweed. Also because electricity is used to move the molecules through the gel. 3 What is it used for? 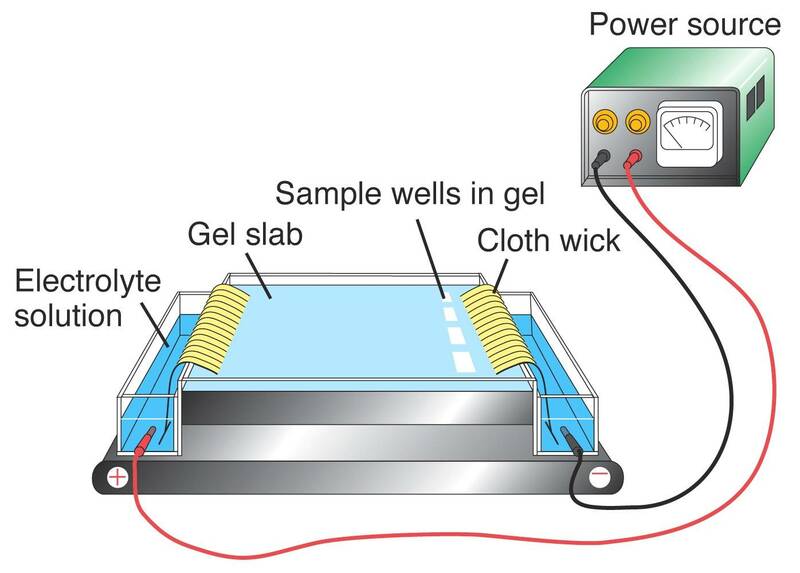 The first step of gel electrophoresis is to create the agarose gel. This involves dissolving agarose powder in TAE buffer and heating it in a microwave for several minutes. TAE buffer consists of three chemicals called Tris base, acetic acid, and EDTA. The agarose solution is then poured into a tray, which has one or multiple combs in it. The gel sets in the tray and around the combs, and the presence of the combs causes small holes, which are called wells, to be left in the gel once it has set. Different concentration of agarose can be used when creating the gel, but the most common concentration is to make the mixture 1% agarose. The sample is heavier than the TAE buffer, so it sinks to the bottom of the well. This is repeated with all the samples, until either all the samples have been added or all the wells have been filled. The tray is then connected to a direct current electricity supply, which is an electricity supply that flows in one direction only, from the negative end to the positive end. These negative and positive ends are known as the negative electrode and the positive electrode respectively. After gel electrophoresis is complete, the molecules will be dispersed throughout the gel based upon their size. The gel will then be placed under an ultraviolet light to visualize the molecules. The molecules will fluoresce under the ultraviolet light due to the RedSafe, and they can then be compared to each other. Often samples of known molecules will be included in gel electrophoresis so that the unknown samples can be compared to them. This allows identification of the molecules in the unknown samples. 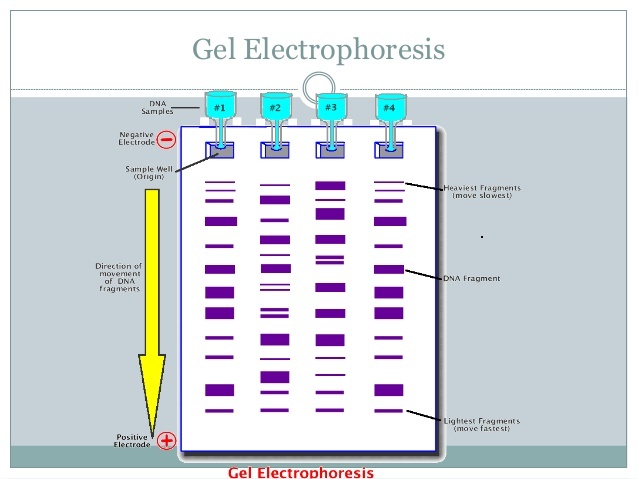 Gel electrophoresis works by making use of the different sizes of the molecules, as well as their electric charge. Molecules have an electric charge, and this causes them to move when exposed to an electric current. The molecules that are looked at using gel electrophoresis have a negative charge, and this means that they move towards the positive electrode when they are exposed to an electric current. However, the agarose gel is a matrix – it can be thought of as a sieve, containing lots of small pores. Because of this, smaller molecules move through the agarose gel faster than larger molecules, and this means that smaller molecules move further towards the positive electrode than larger molecules. It is because of this that the molecules can be compared to each other after gel electrophoresis has occurred. Molecules that are the same are the same size, and this means that they will move the same distance through the agarose gel. This means that any molecules that have moved the same distance are the exact same size as each other, and can be assumed to be identical to each other. In this way the unknown molecules from the samples can be matched to known molecules that underwent gel electrophoresis alongside the samples. This then allows the unknown molecules in the samples to be identified. Gel electrophoresis has many varied uses. 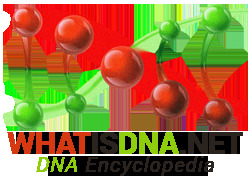 It can be used in forensic testing, to see if the DNA from a sample found at a crime scene matches the DNA of a suspect. It can also be used in paternity testing, by comparing the DNA of both the child and the potential father. If the potential father is the real father they will share much of the same DNA. Gel electrophoresis is also used extensively in scientific experiments, where it has many uses. It can be used to determine the parents of a particular organism. It can also be used to determine if a pathogen or parasite is present in an organism, by seeing if the DNA of the pathogen or parasite is present in a sample taken from the organism. It can also be used in the study of evolution to determine if certain genes are present in individuals from different populations or different species. Mitosis and meiosis – the differences «» What is CRISPR-Cas9?